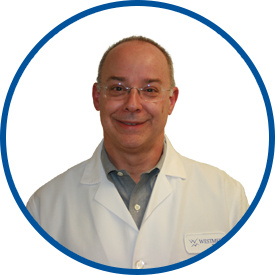 Dr. Lon B. Easton is certified by the American Board of Pediatrics and is a Fellow in the American Academy of Pediatrics. He graduated from Hiram College with a bachelor of science degree in biology and received his medical degree from New York Medical College. Dr. Easton continued his postgraduate medical training at Metropolitan Hospital Center in New York City as a resident and chief resident in pediatrics. From 1980 through 1984, Dr. Easton was an instructor and assistant clinical professor at New York Medical College, as well as a staff pediatrician. Additionally he served as coordinator of the hospital’s primary pediatrics care program. In 1984, Dr. Easton started Throgs Neck Pediatrics in the Bronx, which expanded over the years to include three other pediatricians. The Throgs Neck Pediatrics joined the WESTMED Medical Group in June 2011. Dr. Easton continues to be on staff at Children’s Hospital at Montefiore Medical Center where he has had privileges since 1985. Dr. Easton is very understanding and answers/explains all questions. Dr. Easton has been my children's pediatrician for the past 18 years. I've since moved to Long Island, but still make the trip to see Dr Easton every year. I trust him with my boys unconditionally. my boys are at the age where I leave the room when they get their exams, and I trust Dr Easton with them alone 100%. you cant put a price on that. hes an amazing physician who really cares for his patients. Dr. Easton is amazing. We love him and I would recommend him to anyone. He is the Best!!! Dr. Easton is amazing. He is extremely knowledgeable, caring, and always make me feel like the care of my children is his priority. Dr. Easton is friendly and explains things very clearly, without making me feel inferior. Our family loves Dr. Easton. dr Easton is excellent. professional and respectful of my concerns for my daughter. offers clear answers to my questions. We always had a great experience with Dr. Easton. He is truly the best Dr. any parent would want for their child. We have moved an hour away and still choose to stay in his practice. Dr. Easton has been my pediatric doctor since I was born. I am now turning 16 years old and would not change him for the world. I hope he is still around for when I am older and have my kids, I would definitely choose him as my children's pediatrician. Dr. Easton has and continues to be an amazing doctor! The level of respect and care he provides my son with is beyond words. As a mother, if my son is cared for, treated kindly and spoken to in a way that gives him respect and comfort for the purpose of his visit, I am beyond satisfied. Dr. Easton has provided this care for him throughout his life. I have and will continue to recommend him for the person he is and the care he provides. Dr. Easton and West Med are wonderful. it's a pleasant experience. Dr. Easton is an excellent doctor. *Dr. Easton is the best. Takes time to speak w/you answering all questions and explaining. He is a true consummate professional. *Dr. Easton is a great physician. Very comfortable with him and my son also. *Dr. Easton is phenomenal - a true asset to your practice. He knows my son's history & is very easy to talk to.